Private Pilates lessons are recommended to start your Pilates practice. Get the ultimate Pilates reformer workout on equipment designed by Joe Pilates. Private Pilates lessons are recommended to start your Pilates practice, and are the ultimate workout. Cisco Pilates recommends the "New Client Special" of Buy 3 Privates Get a fourth one Free to start out. (See our Pricing page). We recommend private lessons one to three times per week to start out. They are the best way to get the fastest results, and to get exercises chosen specifically for your body. You'll have a strong foundation for your continued Pilates practice. Cisco Pilates carries Gratz equipment: the Pilates Reformer, Tower/Wall unit, Wunda chair, spine corrector, foot corrector, and toe corrector, all equipped with strong springs to provide the best support and resistance needed for your body to develop strength and control. Private Lesson on the Wunda Chair, a Joe Pilates original design. Pilates is exercise. Just like learning a new instrument or language, it will take time for your body to acclimate to this new way of moving. Some people are sore after their first session and some are not. It all depends on your body. Cisco Pilates is a small private studio. There won't be other people working out in the space at the same time as you. A session is just you and the instructor. The only time you'll be working out with other people is if you are in one our group mat classes. The foot corrector is an amazing tool for helping with foot, ankle, knee, and hip alignment and strength. Joe Pilates designed his own equipment, focusing on using springs to create resistance. Today there are many manufacturers of this equipment, but Gratz is the original manufacturer of Pilates apparatus, and they use Joe Pilates's original designs and measurements. This is an important consideration when choosing your Pilates practice because it will affect your workout and the way your body will change. Cisco Pilates only carries Gratz equipment. Pilates equipment works by using spring resistance, so it is incredibly beneficial for those with one side weaker than another, for those with injuries, and for building overall strength and control. The best way to get started is to try a few privates on the equipment and mat. Depending on your needs and what you're looking to gain from Pilates, an exercise routine will be designed for you. It is recommended that you come to Pilates 1-3 times/week. Mixing and matching mat classes with equipment privates are options as well. Your instructor can give you more details about your specific regimen, and may give you homework. This client has been studying Pilates for over 30 years and is now in his late 80s. He does private Pilates lessons three times a week. Please arrive 5 minutes early to your first session or mat class to fill out a brief form. We will email you the form before your lesson if you'd like to fill it out in advance. You will be asked questions about your body such as your goals, your past or current injuries, and your daily habits that may affect the way that you move. 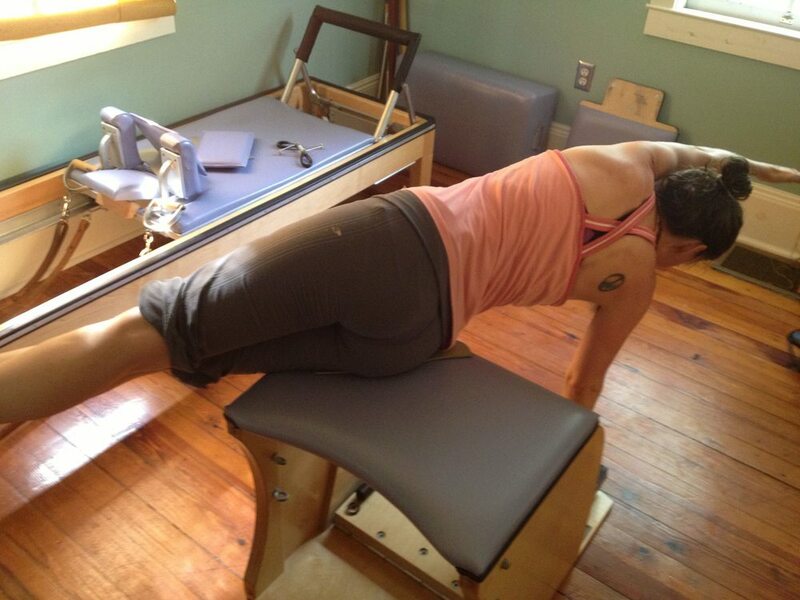 Side sit-ups on the Spine Corrector are a great way to work your obliques! All bulk packages (unless otherwise noted) have an expiration date of 90 days from date of purchase. There are no refunds, only studio credit for private lessons, which expires in 90 days from date issued. There is a 24 hour cancellation policy for all scheduled privates. You will be charged in full for no shows and/or late canceling. You are welcome to send a friend in your place, or if we are able to fill your time slot, you will not be charged. Thank you for understanding. In the case of inclement weather that may affect your ability to get to or from the studio, the 24 hour cancellation policy does not apply.